L: 80" x W: 76" x H: 13"
$1,809.00 Select mattress and base options to see price. Sealy Posturepedic Hybrid Kelburn II Cushion Firm King Mattress A good night's sleep starts with the Sealy Posturepedic Hybrid Kelburn II cushion firm king mattress. Sealy's advanced memory foam with Chill™ and Sealy Immersion™ technology allows for a slower response memory foam for a more breathable, comfortable, cool-to-the-touch sleep surface. This mattress will ensure the best night's sleep that you've had in a long time. A good night's sleep starts with the Sealy Posturepedic Hybrid Kelburn II cushion firm king mattress. Sealy's advanced memory foam with Chill™ and Sealy Immersion™ technology allows for a slower response memory foam for a more breathable, comfortable, cool-to-the-touch sleep surface. This mattress will ensure the best night's sleep that you've had in a long time. L: 80" x W: 76" x H: 18"
L: 80" x W: 76" x H: 22"
This is the best mattress I have ever had. It is a firm so it is very supportive. I used to always go with the memory foam type mattress because it felt nice but always hurt my back. I sleep for hours in this bed. Love love love this mattress!!!!!!!!! Love this mattress!! I don't want to get out of bed in the mornings. I would definitely recommend!!! Love my new mattress! It was a great choice because it provides great support and it's comforting. This mattress is very comfortable. 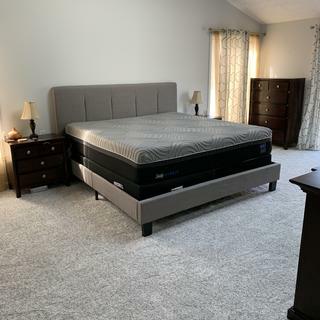 We were coming from a fully memory foam mattress that we loved and were a bit skeptical of anything with springs (any inner spring mattress we've slept on at friends and family has been uncomfortable once we got used to foam) but this hybrid mattress is a goldilocks mattress. Just the right combination or plush and support. Wonderful experience. John was very helpful and knowledgeable about the mattress we wanted. Would recommend to all my family and friends. I've had this mattress for one week and so far it's been great! I used to have a foam type mattress and returned that within a year. This hybrid had the best of both worlds with the cooler memory foam top and the firm traditional support under that. Overall very pleased and hope to continue this way in the years to come! This mattress is very comfortable! 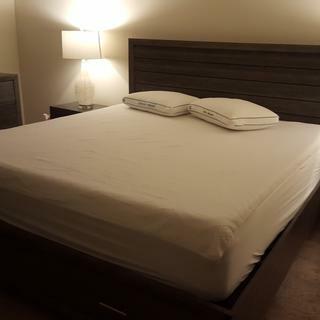 Was skeptical about a hybrid mattress but it is very comfortable & firm enough to support! Love it!! It’s very comfortable all you have to do to soften it up in the winter is walk around in it or like me, let your kiddos jump in it!! My sales associate Beth form Collegeville branch, was very knowledgeable, professional and sweet! We would definitely recommend this mattress. We sleep on our sides, backs, and stomachs, and it is comfortable for all positions. We love this mattress! We are getting noticeably better sleep. Would definitely recommend. My wife loves this mattress and I think it's good too, but I need just a little more firmness so we re-selected. This is so ridiculously comfortable! Very satisfied. The only problem is I don't want to leave my bed in the morning . So far so good. Only been a few nights but sleep so much better than on my old coil spring mattress. I'm 6 months pregnant and needed a lot more cushion than my old mattress was giving, so I'm glad we found this one. It has just the right amount of soft foam and firmness. I’m trying it out, I’m not sure that I like it, I find it to be a bit hard.But I’ll continue to try it out for an other week before I can honestly rate it.I’m not ready to recommend it I only have slept on it 3 times there will be more to follow. This mattress is just too soft for us. We are glad we purchased the platinum plan and can exchange it.